Oceanography major Deana Crouser is doing more than getting her feet wet on the R/V Rachel Carson. She’s helping peer into the future of our oceans. At 5:24 a.m., the R/V Carson’s engine has slowed to an idle. Under the light of a full moon, UW oceanography student Deana Crouser helps researchers lift up a drifter — a floating contraption fitted with a waterproof infrared camera — over the bow and into Hood Canal. Like that of the researchers, the drifter’s work has just begun. As the boat motors on, the drifter’s underwater camera begins capturing videos of tiny animals that play a crucial part in the marine food web: zooplankton. A year ago, Crouser would never have imagined herself filming marine animals in the dark. At the time, she was a chemical engineering major struggling to figure out how to apply her education to helping the environment, a cause she had always believed in. Then she took an introduction to oceanography course. 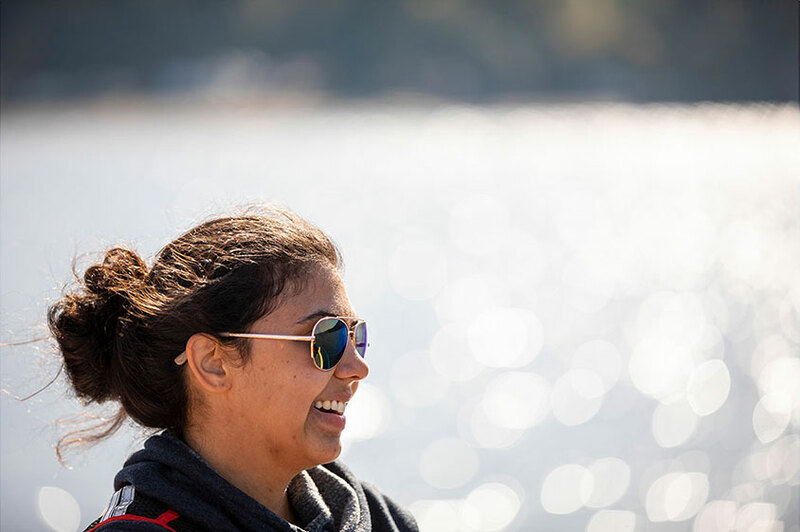 After changing her major to oceanography within the College of the Environment, Crouser landed a summer internship, funded by the National Science Foundation, that culminated in this research cruise. For several weeks beforehand, she spent time in the lab of oceanography professor Julie Keister, helping investigate the relationship between local water conditions and zooplankton populations. Another aspect of her Husky Experience also helps Crouser feel hopeful about the future: her commitment to encouraging other women and people of color to explore STEM careers. She’s the outreach director for WChE (Women in Chemical Engineering) and the webmaster and historian for SACNAS (Society for Advancement of Chicanos/Hispanics and Native Americans in Science). Much of her involvement comes from wanting to show people who look like her that they can be scientists, too. “Even if I don’t know exactly what I’m doing, I still need to show up and show other people that they can be where I’m standing,” she says. Crouser admits that when she started her internship, “I didn’t know the name of one kind of zooplankton. I didn’t even know where they were in the food web.” Now she grasps their immense importance. Zooplankton spend their lives evading predators and searching for food — usually phytoplankton, the microscopic algae that are the linchpin of all ocean life. Where phytoplankton bloom, so do zooplankton; and where zooplankton thrive, so do larger marine animals, from salmon to orca whales. What will happen to zooplankton as our oceans continue to warm and absorb human-produced carbon dioxide, growing more acidic and hypoxic (low in oxygen)? And if they adjust their behavior because of these factors, what happens to the animals that feed on them? These are big questions with big ramifications. To help peer into the future, Keister and fellow UW School of Oceanography Professor Daniel Grünbaum are starting very, very small. What are zooplankton, and why do they matter? For 10 days in September, Keister and Grünbaum cruised around Hood Canal on the R/V Carson, researching how zooplankton change their behavior in response to environmental conditions. Assisting them were Crouser, oceanography graduate students Sasha Seroy and Amy Wyeth, and volunteer Juhi LaFuente. Part of Puget Sound, Hood Canal is a nearly 70-mile-long glacial fjord that runs down the east side of Washington’s Olympic Peninsula, then crooks back to the northeast. Its waters are naturally more acidic than the open ocean’s, and its oxygen content drops in late summer and fall. 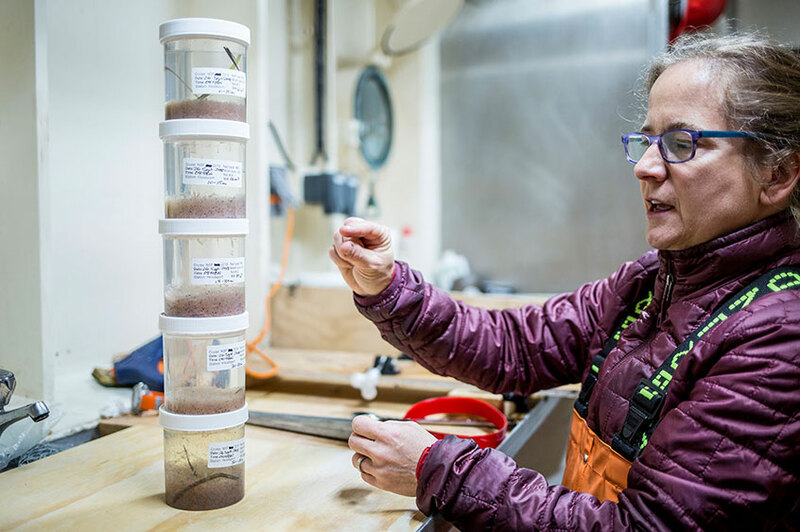 Professor Julie Keister stacks samples from different depths to show how zooplankton migrate in the water column. Back on the R/V Carson, Crouser and Seroy are labeling containers full of specimens that were just hauled up from different depths. One contains a thick soup of tiny krill and zooplankton. Another sample, from shallower water, is sparsely populated. It’s a vertical snapshot of a mass migration: Zooplankton surface at night to eat phytoplankton, then head back to deeper, darker water to avoid being seen by predators in the daylight. 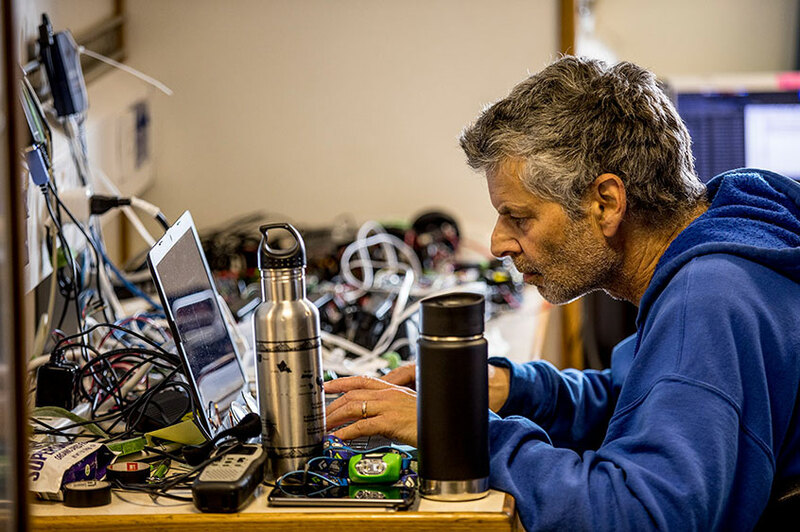 Across a narrow passageway, Grünbaum is working at a table covered in wires, housings, infrared cameras and microcontrollers (small computers). He holds a microcontroller that will soon be attached to a drifter. “The technology is making this research easier, and the engineering is getting better and better,” he says. 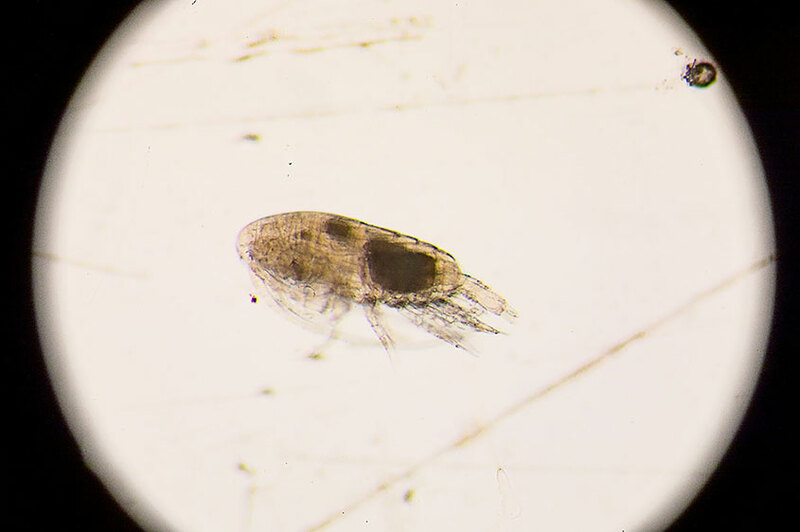 That’s good, because in addition to tracking the movements of large zooplankton populations, he and Keister are observing individual zooplankton in their natural habitat with the help of infrared video cameras. It’s hard to fathom that the behavior of a single microscopic creature might give us insight into the future of the Puget Sound and our oceans. But Keister and Grünbaum suspect that zooplankton’s behavior in response to changing environmental conditions may be magnified as they ripple up through the ecosystem. Grünbaum gives an example of what these movements can teach us: If significant populations of zooplankton are able to hide in low-oxygen waters to avoid predators, we may see a drop in salmon populations and an uptick in jellyfish — predators that are better suited to those conditions. Whatever the findings, says Keister, “It could have significant implications for the food web.” This includes humans: where we harvest animals, and what we are (or are not) able to catch. Professor Daniel Grünbaum assembles infrared cameras to film zooplankton in dark waters. It’s nearly 2 p.m., and Crouser has helped haul up the last of the drifters. Dozens of containers of specimens await transport to UW labs, where they’ll be studied and added to a host of data from the previous year that may help shed light on the future of our oceans. For having been awake since 3 a.m., Crouser is remarkably alert — and optimistic about her place in the future of oceanography, whether by measuring environmental impact or by increasing diversity in STEM professions. As she continues on her career path, Crouser faces the reality that tomorrow’s ocean may be starkly different from what she’s known her whole life. Graduate student Amy Wyeth rinses off equipment before it is reused on a zooplankton-catching device known as a multinet. The R/V Rachel Carson is a 78-foot research vessel purchased in 2017 with the help of a $1 million donation from William and Beatrice Booth. Beatrice, who earned her master’s in biological oceanography from the UW in 1969, was one of the first women scientists in the graduate program. She devoted much of her life to our oceans, working here as a biological oceanography researcher for 24 years. Named after celebrated American conservationist Rachel Carson, the R/V Carson unlocks many possibilities for UW researchers. Compared to its predecessor, the much smaller R/V Barnes — a former tug boat — the R/V Carson was designed as a research ship. With larger lab space, better tools for lowering equipment into water and more space for people to sleep, the ship is much better equipped for multiday trips with more researchers. And, unlike the R/V Barnes, the R/V Carson is capable of traveling offshore for coastal ocean research. 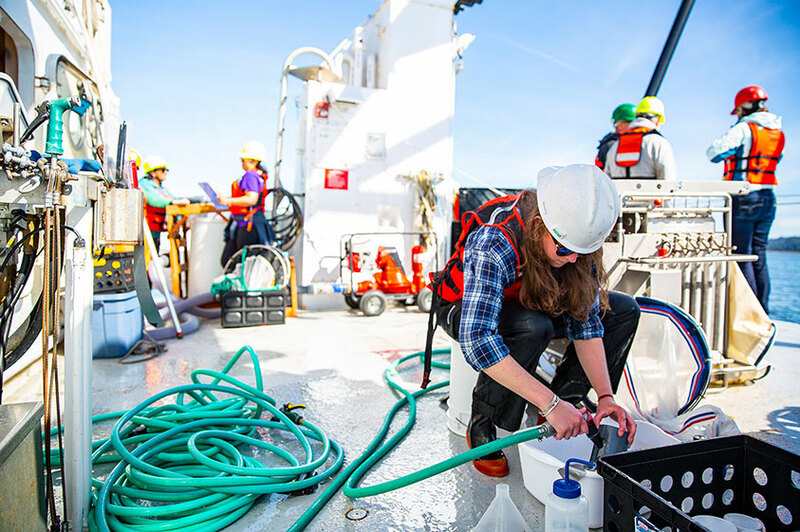 The R/V Carson also helps connect scientists and students to their nearby waters: It’s available for use by oceanographic researchers and instructors from outside the UW, too. 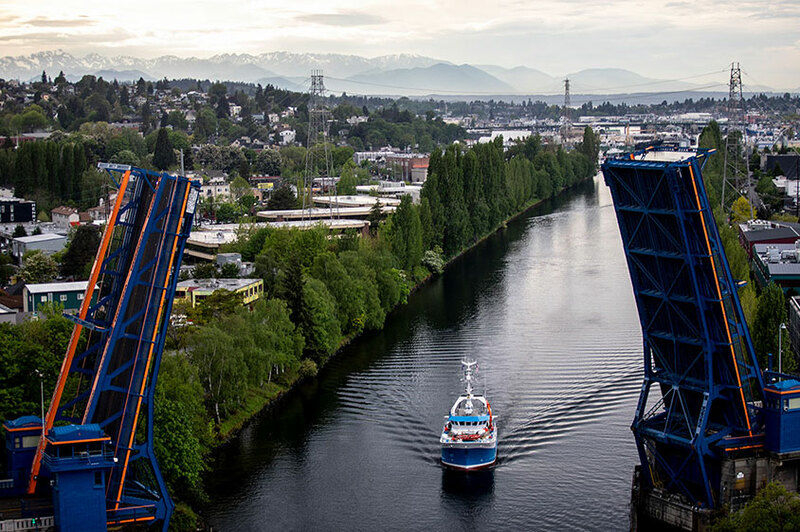 The R/V Carson passes under the Fremont Bridge on its way back to the UW. The University of Washington is undertaking its most ambitious campaign ever: Be Boundless — For Washington, For the World. When you support immersive learning at the College of the Environment, you help students get hands-on experiences that prepare them for their dream careers.